Help a local crafter export his musical instruments outside Murkmire. 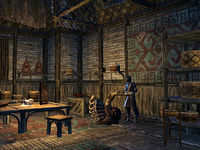 A local crafter, Nesh-Deeka, hopes to establish a trade agreement with Captain Jimila to sell an Argonian musical instrument abroad. He wants me to act as his agent and secure a deal for his vossa-satl. Talk to Nesh-Deeka outside his music shop near the western gate of Lilmoth. Speak to Tolwin Bordier, Claws-the-Ghosts and Ruja-Wan who can be found around town. Catch Moss-Foot Croakers in area west of Lilmoth. Find and chase Ruby Hopper around town till gets to tree then catch it. Head outside town to Indigo Tree Frog Grove. Catch fleshflies hanging around trees, lure frogs down and catch them. Collect plants needed for Toad Musk which can be found just outside Lilmoth. Head to Toad Mud Pit and use musk. Return to Nesh-Deeka and give him frogs. Wait for him to tune up vossa-satl. Take vossa-satl to Captain Jimila in tavern and convince her to start business arrangement. Nesh-Deeka asked me to talk to a few people around town who have dealt with Captain Jimila in the past. He wants to learn enough about the Captain to make a good impression. I spoke to a few of the people in Lilmoth who have worked with Captain Jimila in the past. Now I should talk to Nesh-Deeka and let him know what I found out. Nesh-Deeka suggested I start by gathering the moss-foot croakers from the marsh east of Lilmoth. If I need additional information, I can refer to the written instructions he provided me with. Next I need to find a ruby hopper. They like to sun themselves on stones near water around Lilmoth. I need to find the ruby hopper I frightened off. Nesh-Deeka's note suggests I can find it hiding by the big tree at the center of Lilmoth. To catch the next frog on the list, the indigo tree frog, I need to locate a grove of trees where they have congregated. I found a grove of trees housing the indigo tree frogs. Now I need to gather fleshflies to use as a lure to get the frogs out of the trees. I gathered fleshflies. Now I need to release the flies beneath the trees to lure the tree frogs down so I can capture a few of them. The indigo tree frogs have descended from the trees to feast on the flies. I should grab a few of them before they hop away. To attract the elusive sun-blessed toad, I need to gather ingredients to make an odoriferous musk that will trick them into emerging from their mud pit. I need to find the following plants: stench sedge, salt rush, and joymallow. I gathered the ingredients. Now I need to mix them together to create the pungent toad musk. I created enough toad musk to attract the sun-blessed toads. Now I need to locate a toad mud pit and see if it contains any of the yellow toads. According to Nesh-Deeka's instructions, I need to pour the musk onto myself to attract the attention of the sun-blessed toads. Now that I'm drenched in the musk, I need to turn the crank of the croak-wheel to simulate the sound of a frisky toad. Between the smell and the sound, it should attract a sun-blessed toad. The combination of sound and smell lured a sun-blessed toad out of the mud pit. I need to catch it for the vossa-satl. I gathered all of the frogs Nesh-Deeka asked for. I should return to Lilmoth and talk to him. I gave the frogs I gathered to Nesh-Deeka. Now I should follow him into his shop and see how the vossa-satl works. I should stay out of the way while Nesh-Deeka tunes the vossa-satl. Nesh-Deeka seems happy with the way the instrument sounds. He wants me to take it so I can present it to Captain Jimila. I should talk to Nesh-Deeka and ask him if he knows where I can find Captain Jimila. I need to find Captain Jimila at the Lilmoth tavern, give her the vossa-satl, and then attempt to convince her to agree to a deal to export them for Nesh-Deeka. Finishes quest Captain Jimila agreed to take five of the vossa-satls and see how they sell. I should inform Nesh-Deeka that he has a deal. This page was last modified on 5 February 2019, at 00:16.